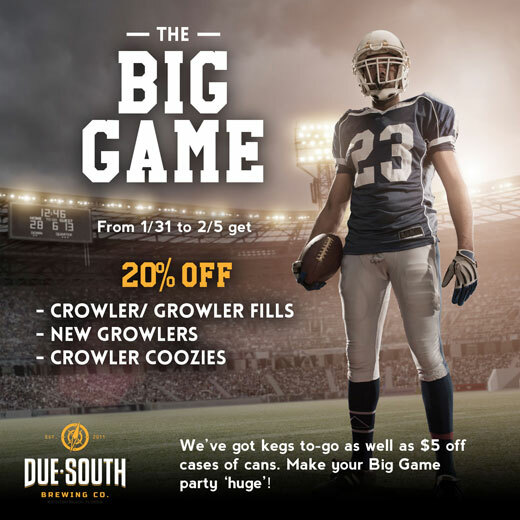 Big Deals For The Big Game – Due South Brewing Co.
Have an upcoming party this weekend for the ‘Big Game’? Whether you’re a fan of the New England Patriots or the Atlanta Falcons, rest assured you and your guests can come together in agreement over delicious locally brewed craft beer. For this special event, we at Due South Brewing Co. are presenting a promotion for the weekend: 20% off crowler and growler fills, as well as crowler/growler accessories and even new growlers! We’ve even got a wide selection of beers on draft in our taproom to choose from. If you’d rather get your beer in kegs, we’ve got plenty stocked up for you, so call (561-463-2337) or come in to the taproom to place your order.